Ordinarily I'm one of the games biggest critics........................but I actually prefer this VXP format, although it isn't without its flaws. The biggest flaw has to be hull specific targets. I've got no problem with class specific targets (e.g. siege or skirmish), but a lot of players won't have the necessary fleets to complete a tier set for the bonus. And some will have recycled older hulls like the Tideseeker or Hunter MK1, especially with the free Batray fleet. The other big flaw has to be the noticeable lag or slowdown for this VXP weekend. I'm having to constantly refresh to keep the game from locking up. But that said, being able to claim tokens for future hulls is a massive bonus. My Brutal Erad still has 2 days build time, so I thought I'd missed out this weekend - but I've been able to stockpile a few tokens for when it's finished. So I think the format is a good one, but does need tweaking if it's used in future. I agree with you mostly. One problem you likely haven't seen is how many tokens you are going to need to rank that new ship of your's once it's built. After grinding a getting a "few" I think you might be a little disappointed what 1 token actually does to 1 ship; when you figure you have 5 to rank. What tokens for Brutal Era ? I hear you - the VXP tokens don't go far, that's for sure. But I figure if I can get between 30 & 45% VXP rank, it'll be better than nothing - especially given the Erad needs reload buffs to make it worthwhile with no splash or shockwave damage. Think another problem is the repair times for older hulls - fleet of old Tides with a Harlock Tide take forever compared to a lot of newer hulls. Just one more nail in the coffin of killing this game. nice job on not listening to your customers and total screwing up a VXP weekend. When will you guys wake up and start listening? 28980 online now,thats sad for a "vxp weekend".not more to say i think. Folks, the sad answer is that they aren't listening, or they don't care...or both. Apparently they needed to monetize VXP. Might even be the last place they could go to try to squeeze more money out of the game - they don't care whether we like it or not. They just need the money. I hope that the game will last another 6-12 months. But I fear that it may not last that long. how are we suppose to rank conquoror hulls and the lurker? can't hit any of the vxp targets. conq vxp can be reaserch at R&D and for defenders you can win tokens wen kill 98s i think. 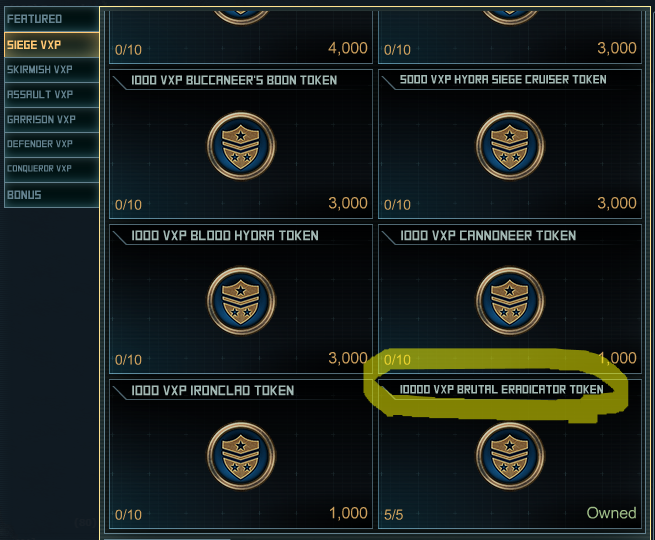 So no Plain VXP tokens? Like Defender, or Conqueror.. Seems this extra event was useless... Another thing added to all the crap we already have to do..
Well what can i say that hasn't allready been said,i did the 100 and 102 just a little more damage than previous raid,but i could not kill the 98 and i tried 4 times still no kill so i gave up,if the 98 is anything to go by i wont be doing next raid,the damage was incredible,those flame throwers ripped my fleet apart,and those long range cannons (forgot there name ) done a lot more damage than they should have. Congratulations Kixeye. In changing the VXP weekends, you have successfully ignored the golden rule of game design and development: if something works... DO NOT KIX IT UP! There's no way this game is going to last another year at this rate. It's impossible for new players to make it on their own, and existing players continually get shafted. Need to take the limit off the inventory capacity for redeemed vxp tokens. For example, the limit for Erad tokens is 5. The benefit of this vxp format was the ability to gain vxp without having all the hulls built. Five tokens not going to cut it for my last two erad hulls which still need to be built. PLease remove the inventory limit. How long will be the redemption period? If a week, then may not be an issue. If a day, then I will be forced to coin erads just to use the points from the event. If I was going to coin the hulls, the old format would have been cheaper with less seat time. tokens ridiculous for what you get. And lets not start on the Rogue Crew chests. That Kixeye is not a slap in the face that is a baseball bat to the back of the head-it isn't even realistic. 200K points for a 2 star Rogue Crew or maybe a 3 star one that's useless like the majority of crews these days? I don't get why you treat the players like this. It surely appears that you couldn't care any less about the players at times. And now in a few days still ANOTHER EVENT-Bounty? What is the deal with you? Do you think players are made out of money? You cater to the 1% on this game to the point where the rest of us feel less and less wanted every day. Will the REWARD STORE close at the end of the event? Dear Kixeye, This has been the absolute WORST VXP event EVER....! What happened to easing up on content? It seems as though you just want to fleece every player, of their hard earnt $ with every new event. I guess if you want to push people away, your strategy is perfect. Just keep going this way and only the whales will be playing!!! Speak up emil! wtf am I missing? You "dislike" my input but offer no criticism. Level 100 only spawns from Friday 9am - Sunday 9am, So at 8:30 no targets? I guess lying comes easy to some!! !